Taking a vacation to rest, relax, and recharge is an important part of maintaining good mental health. To really reap the benefits that come from taking a break from everyday life, vacationers should try their best to enjoy a vacation that takes them outdoors. For those who are looking to enjoy an exciting and beautiful outdoor vacation, there are few places better than the southern Utah area. This area provides many national and state parks, historical monuments, and boasts comfortable places to stay. Those who either own or rent an RV for their vacation will need a relaxing RV park to settle into while in the southern Utah area. 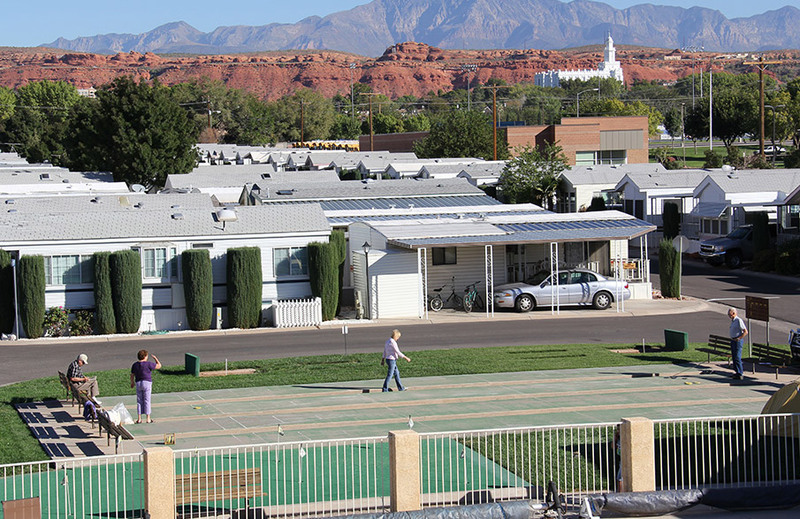 Luckily, there is a lovely RV park, called McArthur’s Temple View RV Park, in the city of St. George. This RV park goes above and beyond when accommodating its guests. Both those who are new to RVing and those who have stayed in hundreds of RV parks will find that Temple View provides one of the best experiences they have ever had. When choosing the type of vacation to go on, many people never consider an RV vacation. These people are really missing out. Traveling in an RV for a vacation and, ultimately, choosing to stay at Temple View RV Park will provide an incredible, unforgettable vacation. Those who are new to Temple View or RVing, in general, may want some more information before heading to southern Utah. Some things that are great to know before getting behind the wheel are the benefits of vacationing in an RV, what to expect from Temple View, the extra perks that Temple View offers, and what types of things there are to do around Temple View. The following will answer these questions and more, which means all that’s left to do is get in the RV and head to Temple View RV Park. Recreational Vehicles, or RVs, can serve a few different purposes. People usually buy RVs either to take vacations or to live in them part or full-time. There are many benefits to having an RV for both uses, and, in many ways, RVs excel far beyond what most people get from a regular vacation. The most common way that people use their RVs is to take vacations and road trips throughout the year. This may include one long journey across the country or a few short ones to local RV parks and campgrounds. RVs are a terrific way to vacation for many reasons. For larger families, it is a great way to give everyone lots of room to spread out during a long drive. They are also great for being able to stay on the road to reach a destination in a shorter amount of time. This is because food can be made and restroom breaks can be taken without ever having to stop the vehicle. The last, and perhaps most appealing thing about owning an RV for vacations is the ability to go anywhere. Rather than having to stay in a hotel the whole vacation or rent an expensive beach house, RV vacationers can pack up and go wherever they please and make the most of their vacation time. These reasons contribute to why RV vacations are becoming so popular. The other way many people use their RVs, though less common, is to live in them either year-round or for part of the year. People who live in RVs can call the entire country their backyard, picking up and going whenever the mood strikes. They can also avoid harsh weather by moving across the country to always stay in their favorite season. RV residents will save money compared to living in a house or apartment, and they will likely form a stronger bond with the people they are living with. While living in an RV may not be ideal for everyone, it is certainly worth considering for those who love to travel. No matter how an RV is used, it is a great way to spend some time and have new experiences. For those who will be traveling in southern Utah in their RV, there is no better place to live the RV lifestyle than at Temple View RV Park. For over three decades, the McArthur family has provided guests an unmatched experience. Those who stay at Temple View RV Park are delighted by the family atmosphere, the extra attention to details, and the overall enjoyment gained from staying somewhere that the owners truly care about their customers. Jim and Denise McArthur built Temple View RV Park on a section of their family-owned land. They did this after seeing that the St. George area needed somewhere to accommodate the many people who traveled in RVs. In building this RV oasis, they have created a community atmosphere that is tailored specifically for those who enjoy the RV lifestyle. In every detail, from the RV sites to the amenities, guests will see how much the McArthur family cares about its guests. Throughout Temple View, guests will discover amenities and extras that set this RV park apart from the rest. With its long list of amenities, there is something at this RV park to make every traveler feel relaxed and pampered. There are 260 RV sites throughout Temple View RV Park, with 50 of them being pull-thru sites. Each site gives guests a patio to pull up to, space to park two vehicles, full hookups, free wireless internet, access to cable TV, and so much more. The sites at Temple View can accommodate RVs up to 45 feet long, meaning just about every vehicle will fit comfortably. The sites have a private, small-town feel and are situated on a nicely paved road. The pool and Jacuzzi at Temple View are surrounded by a spacious pool deck which has a privacy fence enclosure. The pool has both a shallow and deep end so the whole family can enjoy a swim. The Jacuzzi is a great way to relieve tense muscles after a long, fun day outside. 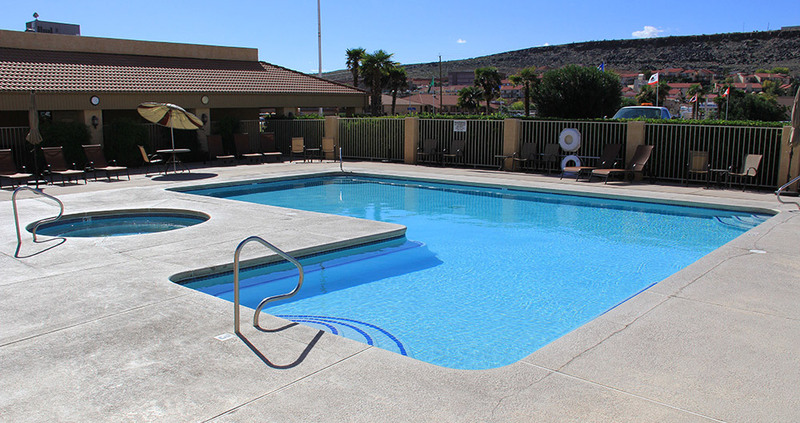 This outdoor pool area is a great place to rest and relax while at Temple View RV Park. For some outdoor fun, Temple View has a well-maintained horseshoe and shuffleboard area. These areas are a great way to make new friends on the road and swap travel stories. Those who are just learning how to play horseshoes or shuffleboard and seasoned pros will both enjoy this lovely outdoor gaming area. 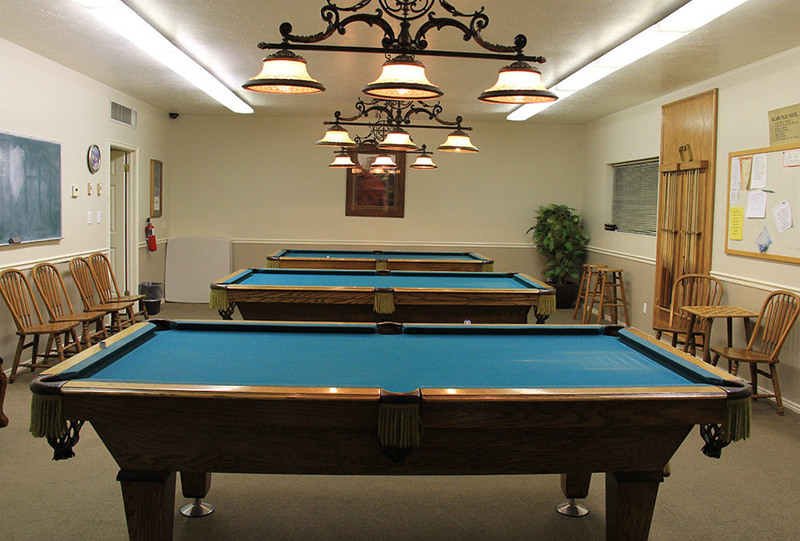 Head inside the indoor area of Temple View and challenge friends, family, or new acquaintances to a game of pool. There are multiple pool tables to accommodate many groups. Once guests start a game of pool, they will find themselves back in the indoor gaming area time and time again to make new friends and show off their billiard skills. The lounge area of Temple View gives guests the chance to relax and get out of their RV for a while. 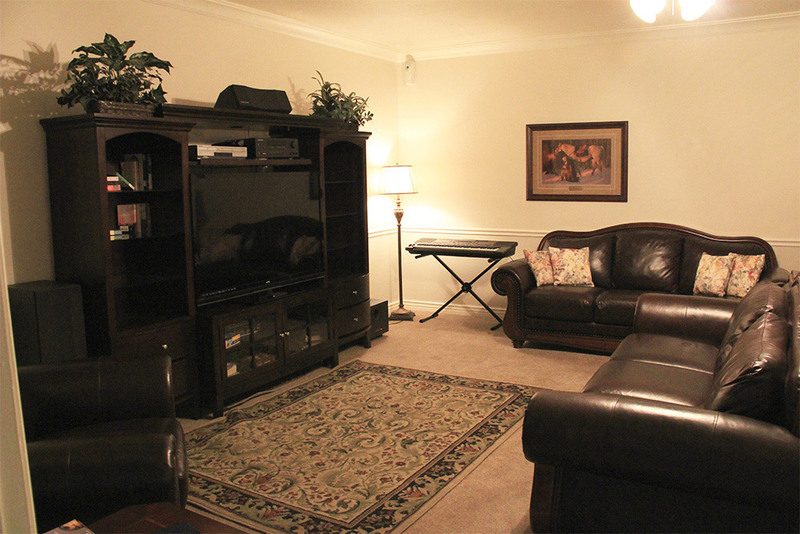 The lounge features big, comfortable seating and a television with many cable channels. The lounge is spacious enough for larger groups but still has a cozy, comfortable feel. Inevitably, guests will need a place to clean all their clothing and bedding during their vacation. Therefore, the laundry room at Temple View is such a blessing. 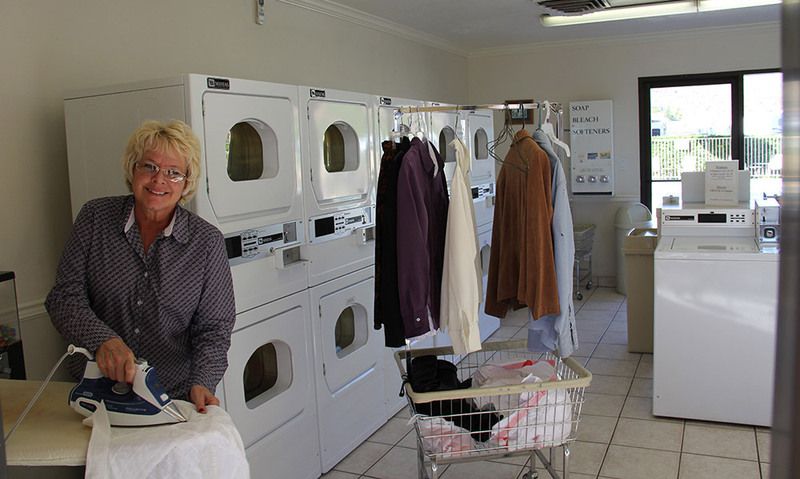 Guests can use their top-of-the-line washers and dryers, iron their clothes, and use the folding tables to help get everything in order. The washrooms and bathrooms at Temple View are above and beyond what can be found at many other RV sites. They have spacious, private showers with plenty of hot water to go around. 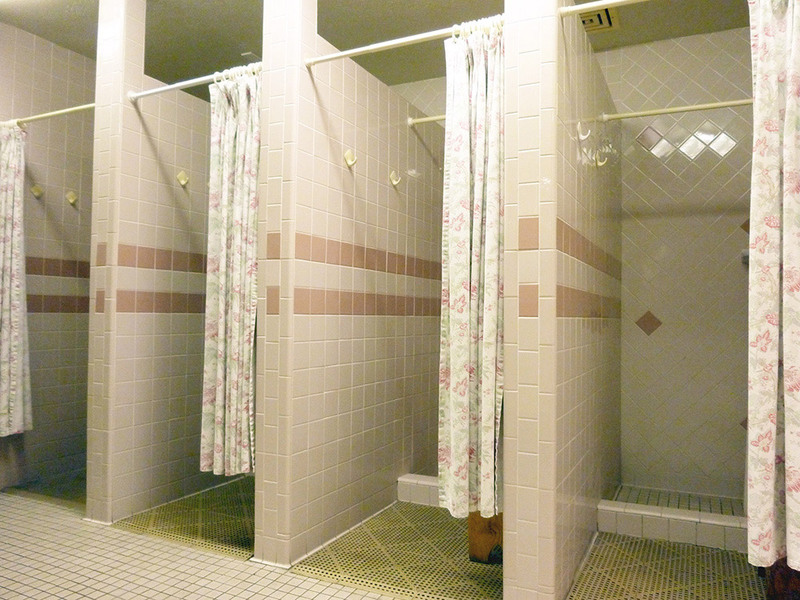 There are many shower stalls, so waiting to get clean is usually not an issue. There are so many things to see and experience while staying at Temple View RV Park. Below are just a few of the places that shouldn’t be missed during a vacation here. This exciting business has things like miniature golf, go-karts, batting cages, and arcade games for the whole family to enjoy. This is a great treat for those who stay at Temple View because Fiesta Fun is just minutes away from the RV park. This beautiful national park is rapidly gaining popularity as travelers realize just how beautiful Zion is. Travelers can hike, bike, climb, and ride their way along the impressive landscape. The beauty of Zion is one of the best reasons to travel to southern Utah. In St. George, Springdale, and the many other cities near Temple View, guests will find a variety of museums to explore. There are art museums, natural history museums, and museums dedicated to the people who made southern Utah what it is today. There are many designated historical sites surrounding Temple View that are fascinating to explore. These sites celebrate the ancient history of the area, with things like dinosaur evidence and ancient artifacts. They also educate visitors about the native people and pioneers in southern Utah, which will give travelers a new appreciation for the southern Utah area. To vacation in an RV is to enjoy the comforts of home while on the road or in a new and exciting location. There are so many amazing things to do and see during an RV vacation to southern Utah, and calling Temple View RV Park home during a vacation will make it a trip that is talked about for years to come.